Denali National Park — It’s More Accessible Than You Think! Located about 240 miles north of Anchorage and 120 miles south of Fairbanks, Denali National Park (www.nps.gov/dena) is one of the crown jewels of the 49th State. One of Alaska’s eight national parks, Denali occupies just over six million acres of wild land, bisected by a seasonal road. And if all that sounds a bit rugged for your taste, rest assured the park is relatively easy to access for wheelchair-users and slow walkers. Granted, scaling the 20,310 namesake mountain may not be on your to-do list; however the park also offers a nice selection of wheelchair-accessible trails, attractions and tours suitable for non-mountaineering visitors. Although there’s no airport in the park, Denali is accessible by rail and car. The prime visiting months are from late May through early September, but that’s primarily because of the train schedules and the unpredictable weather. Still if you have a vehicle, and a bit of a sense of adventure, late spring and fall can also be beautiful times to enjoy Mother Nature’s majesty in Denali. Daily train service is available from Anchorage and Fairbanks on Alaska Railroad’s (www.alaskarailroad.com) Denali Star during the summer months. The train also stops in Wasilla and Talkeetna, and features lift-boarding at the stations, and elevator access to the second level in the GoldStar Dome Cars. Accessible seating and lavatories are also available in standard coach — known as Adventure Class on Alaska Railroad. The journey from Anchorage to Denali takes about eight hours, with arrival in the late afternoon; while the trip from Fairbanks arrives just past noon after a four-hour journey. 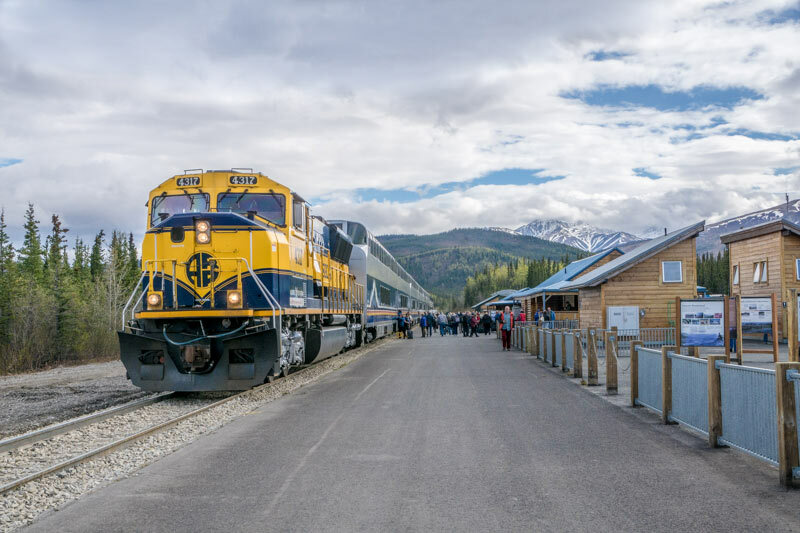 Most of the major cruise lines also offer cruise tour packages that include a Denali stop, with transportation aboard their own accessible railcars. 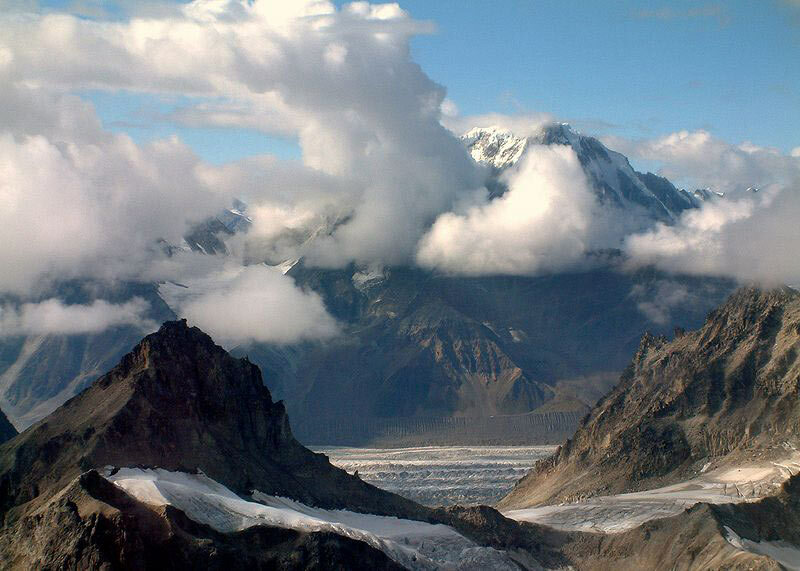 The George Parks Highway (Highway 3) runs between Fairbanks and Anchorage and offers access to Denali National Park. Also designated as a National Scenic Byway, the trip along this stretch of road is nothing short of spectacular. The drive on this well maintained paved road is doable in a day from Anchorage or Fairbanks; but plan for extra time as there’s no shortage of viewpoints and roadside stops along the way. Accessible rental vans are available in Anchorage at Accessible Vans of America (www.accessiblevans.com) and Alaska Mobility (alaskamobility.com). And don’t leave home without a copy of The Milepost (www.themilepost.com), known as the Bible of the North, and a must-have resource for any Alaska road trip. After the 92-mile long road in Denali National Park is cleared of snow in late spring, it’s open to private vehicles as far as Savage River, or for about the first 15 miles. Transportation further into the park is available from concessionaires on transit or tour buses; while free shuttle buses run along several routes near the park entrance. Either way, it’s very easy to enjoy the park with a car. The courtesy shuttle runs three routes — the Savage River Loop, the Riley Creek Loop and the Sled Dog Demonstration Shuttle. The first two routes run all day, while the Sled Dog Demonstration Shuttle departs from the visitor center beginning at 40 minutes prior to the demonstrations, and returns shortly after they are completed. All of the entrance area shuttle buses are wheelchair-accessible. A list of shuttle bus stops can be found in the park newspaper, while the schedules are posted at each stop. The transit buses, which are operated by Aramark, take visitors past the Savage River road closure, but they don’t offer any interpretation. They do however make occasional wildlife viewing and restroom stops. Unlike the tour buses, passengers can get on and off along the route, then reboard another bus to return to the entrance. Prices vary depending on the end destination, which is determined by road conditions. Offerings can range from a short 6.5-hour trip to Toklat or a full 13-hour round-trip to Kantishna. There are no food or beverages available in the park or on the buses, so visitors need to bring along whatever they need for the day. 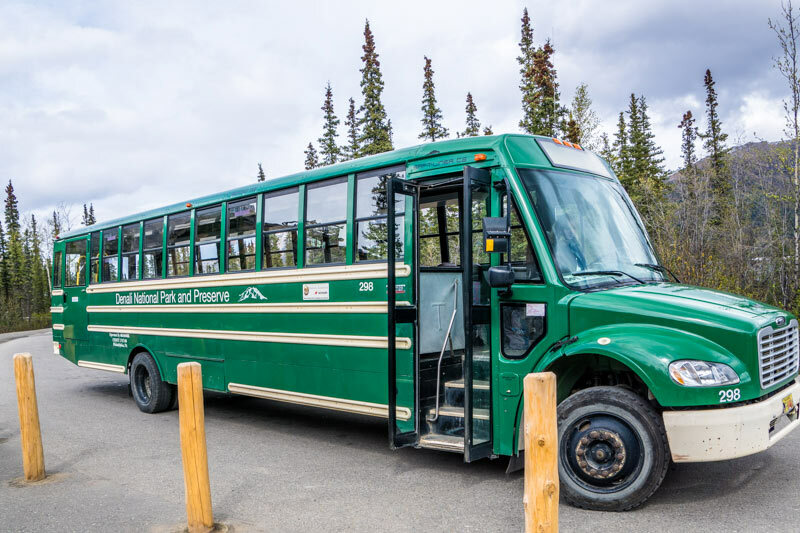 Advance tickets for transit buses can be purchased at www.reservedenali.com; however 35% of the tickets are held for walk-ups and are available at the Wilderness Access Center in the park. Wheelchair-accessible buses are available upon advance request. Tour buses offer the most comprehensive overview of the park, as they include a guide who details the natural and cultural history of the park. Depending on the length of the tour, some tour buses also include a sack lunch. The tours range from 4.5 hours to 12 hours and include numerous stops and wildlife viewing opportunities. Tickets can be purchased from Aramark at www.reservedenali.com, and wheelchair-accessible buses are available upon advance request. Several accessible trails are located near the park entrance in the Riley Creek area. At the top of the list is the McKinley Station Trail, which runs from the Riley Creek Campground to the visitor center. This 1.6-mile hard-packed dirt trail is covered in crushed granite; and although it’s not completely level it offers an undulating — and accessible — route through the forest. There are also a few accessible boardwalk sections along the way. Be forewarned though — there’s a short cut to the visitor center about half-way along the route, but it goes straight uphill. Stick to the original trail for a gradual accessible path to the visitor center. 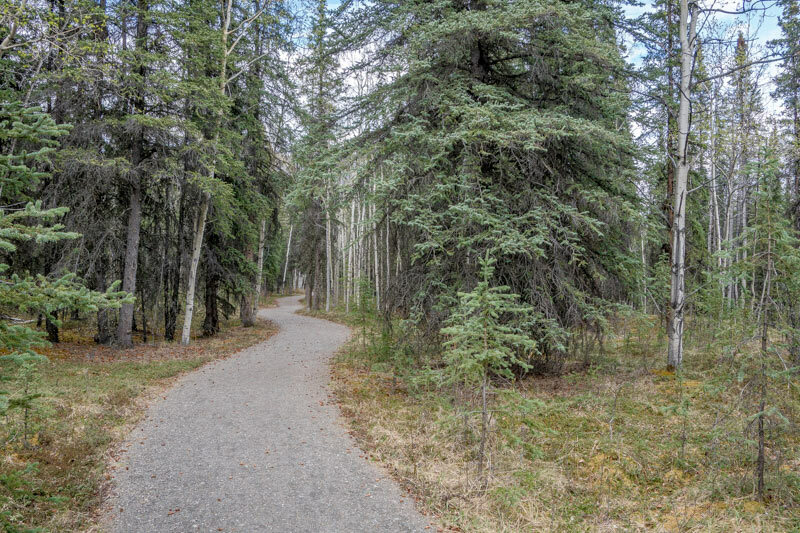 If you’d prefer a shorter walk, check out the Spruce Forest Loop, which is located right behind the visitor center. This .15-mile trail meanders through the forest, and offers visitors a good introduction to the vegetation and wildlife found in the park. It’s also very convenient, as you can just take the free shuttle to the visitor center and hop on the trail from there. And although it’s not exactly a trail, the Sled Dog Demonstration is a must-see while you’re in the Riley Creek area. Although accessible shuttle service is available from the visitor center, you can also drive over to the kennels. There’s plenty of accessible parking available at the kennels; however it’s a longer jaunt from the parking lot than it is from the bus stop, so slow walkers might want to consider the shuttle instead. It should also be noted that the Roadside Trail that runs from the visitor center to the kennels has a steep grade and numerous obstructions, and it’s definitely not accessible. That said the sled dog demonstration is fun to watch, as the team is hitched to a wheeled sled that speeds around a dirt track. Accessible seating for wheelchair-users and slow walkers is available in the front, so everyone is guaranteed a good view. 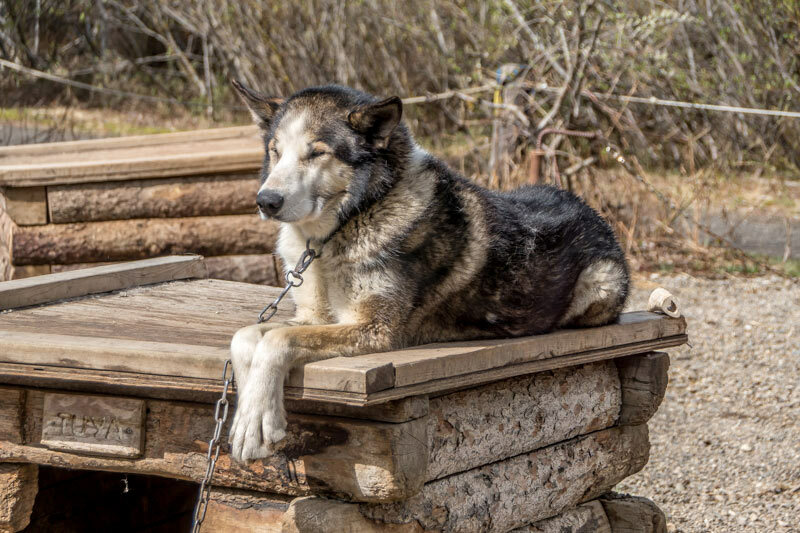 A ranger is on hand to answer questions about the sled dogs — which are still used in the winter in the park — and folks can walk though the sled shed and around the kennels after the demonstration. Best of all, there’s no charge for this educational demonstration. Last but not least, save some time to explore the Savage River area of the park, which offers a few accessible trails, along with the chance to get a glimpse of the park’s namesake peak. The best way to get to the trailhead for the Savage Cabin Loop is to take the free Savage River shuttle bus and get off at Savage River Campground. The trail starts just to the left of the bus shelter, and there’s an accessible vault toilet near the trailhead. 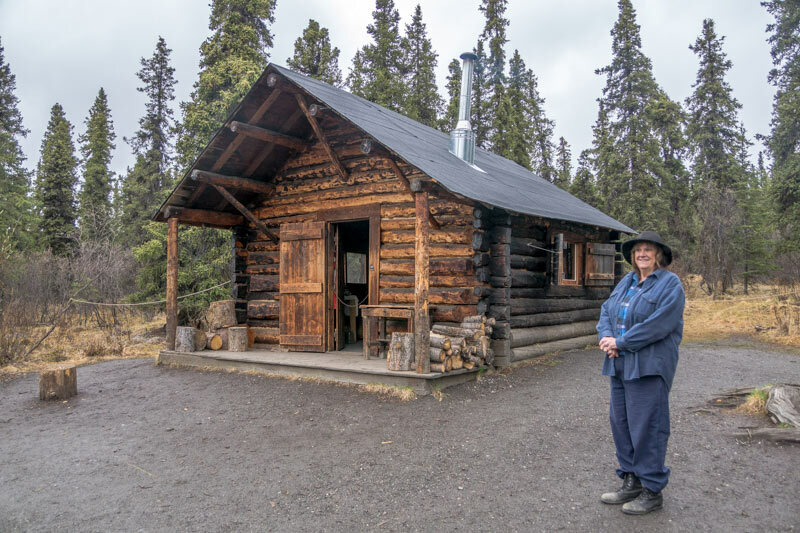 The .8-mile hard-packed dirt trail leads past a historic cabin which was constructed by the Alaska Road Commission in 1924. Usually there’s an interpreter at the cabin, as many tours stop there; so you can also take a peek inside the structure, even though it’s not accessible. While you’re in the area, save some time for the Mountain Vista Trail, which is located just down the road. From the Savage River Campground bus stop, take the trail to the right, cross the main road, and continue along the trail for about a quarter-mile to the Mountain Vista Rest Stop. You can also drive to this location, and do the trails in reverse order, as there’s plenty of accessible parking available in the large lot. The .6-mile hard-packed dirt Mountain Vista Trail begins behind the accessible vault toilets and the picnic shelter, and winds through the tundra. There are several spots along the way that offer a beautiful view of the Alaska Range, and you never know what wildlife you’ll stumble across along the way. Pack along a picnic lunch and enjoy it at one of the accessible tables at the picnic shelter, before you work your way back down to the park entrance. Keep your eyes open for Mt. Denali on the way to and from Savage Creek too, as there are several viewpoints along the road, many of which offer great windshield views. And although it’s not unusual for the mountain to be covered in clouds, every now and then it’s possible to catch a glimpse of the rugged peak. And that’s reason enough to plan a visit to Denali National Park.